My journey as an aspiring sustainability sycophant continues. I have touched upon the challenges this throws up on several occasions already. It’s time for an update. Here are four misadventures I have experienced over the past year or so. Please excuse the length of this post – I need to go into the detail to explain the full implications. I am trying valiantly (despite the loud lack of enthusiasm on the part of my husband) to reduce our meat consumption. However, with two children, I also don’t want to scrimp too far on protein valuable for growing bodies. This led me to introduce nuts as a snack. Nuts are great – they tick lots of boxes: very convenient (can be stored at room temperature, low volume-high energy density, easy to divide up into small portions and avoid waste) and very nutritious (lots of good fat and, my favourite, lots of protein). Everyone seemed happy with this arrangement for several weeks till my son suddenly developed unprecedented patches of eczema on the backs of his arms and legs. We visited the doctor whose verdict was that the nuts were probably to blame and thus consumption should be reduced. We have reached an unhappy compromise with oatcakes, yogurt and cheese as replacements. In a household with children who are keen on dive-catching balls and very messy eaters means that clothes are dirtied daily with many stains. However, again, I have valiantly tried to bring in some energy efficiency principles into the household laundry habits. One attempt saw the use of a cold wash with a shorter cycle which had the benefit of both using the least amount of water and electricity out of the cycles on offer. However, as you might have expected, the stains didn’t come out and I was faced either with the option of washing the clothes again at a higher temperature or simply replacing the items as the stains were now indelibly fixed into the fabric. My compromise tactic has been to use a slightly higher temperature (40 degrees) and wait till there is enough washing to ensure the machine drum is completely full. However, again, the situation is less than ideal. Over time with these relatively warm washes, the washing machine may suffer, in particular if it is not sufficiently ventilated between washes. Biofilm, a kind of black scum, can accumulate in the machine and this risks damaging clothes and reducing the performance of the machine. The way to address this issue is simple: by putting the washing machine on a very high temperature (and therefore high energy consuming) cycle every six weeks. However, this may appear counter-productive given that the initial goal was to lower wash temperatures to reduce energy consumption. Similar issues arise with my attempts to reduce energy consumption from dishwasher use. I opted for a rapid cycle, again to lower water and electricity use, but it has meant there has been a built of really unpleasant peach-grey slime inside the machine. The solution, as with the washing machine, is to try to blast it away with a regular hot cycle and the addition of some no-doubt noxious chemicals. My final example is the one that has caused the most trauma. In the master bedroom, there is an unheated en-suite bathroom with no much ventilation beyond a small extractor fan (there are no external windows or anything useful like that). In summer, as there is no heating on, we can ensure additional ventilation by leaving the bathroom door open and the bedroom windows open to let the moisture escape. However, it’s more problematic in winter. We don’t want to lose heat by opening windows but where will the moisture from the bathroom go? I have tried using a dehumidifier but this meant increased electricity consumption and didn’t seem to do much (a mouldy patch appeared in a corner of the ceiling from the condensation). So we decided to simply keep the bathroom door shut and hope the extractor fan could suffice. However, it appears that the condensation was simply building up in the bathroom. The exposed shower unit corroded and had to be replaced at not insignificant expense, whilst drops of water would drip down the toilet cistern. This caused the washers attaching the cistern to the seat to rust and then leak. 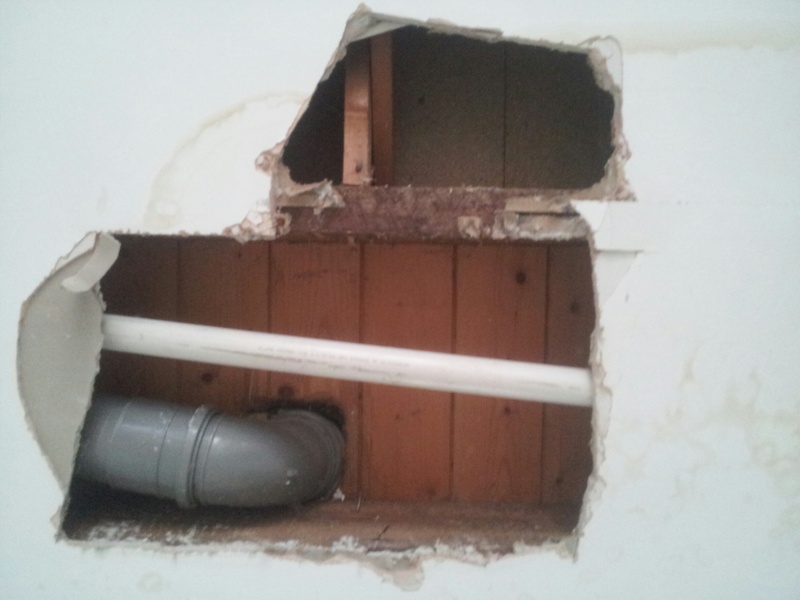 This leak became major, making a large wet patch on the ceiling of the living room below. And in order to work out where this leak was coming from, large holes were cut in the ceiling, which need to be filled and plastered over. Is it worth it? To be honest, I’m not sure.